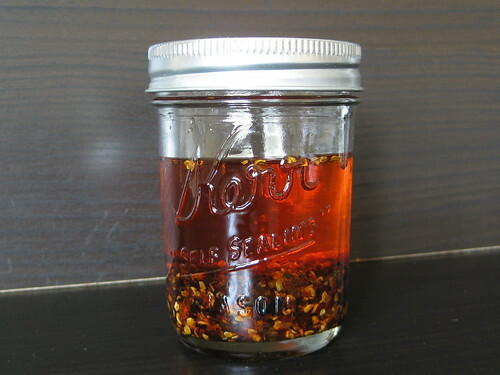 This infused oil super easy to make yourself, and about ten times better (tastes much fresher) than any you can buy from the store. Plus, if you’ve made the pot stickers, you’ll likely have an extra scallion, small knob of ginger, clove of garlic, sesame oil and peanut oil around — basically all you need. The only “new” ingredient is red pepper flakes, which, if you’re like me at all, your pantry is not complete without (a good way make a dent in a Costco-size container!). When used as a condiment, I serve it straight from the jar after a good stir (as pictured with the pot stickers). For frying, though, I first strain out the solids (scallion, red pepper flakes) as they burn rather quickly when subjected to high temps. However you use it, the spicy garlic-ginger-scallion oil adds a delectable zing to any complementary fare. Combine all ingredients in a small saucepan (I use a 2 quart, it’s my smallest). Set pan over medium-low heat and, stirring occasionally, bring to a simmer — a lot of tiny bubbles will surround the ginger and garlic, some will rise to the top. Reduce heat to low — it will hardly look like it’s doing anything, but the occasional small bubble will come up from the bottom — and continue cooking, swirling the pan occasionally, for 30 minutes. Remove from heat and cool to room temp before removing and discarding ginger and garlic pieces. Pour the oil and solids (a rubber scraper is helpful for getting every last drop) into a glass container (1 cup is a good size, I’d avoid plastic because oil is hard to remove from it — this one is rather aromatic, to boot) and store tightly covered in the fridge² (should keep for up to two weeks, possibly longer). For best flavor, bring to room temp before using. ¹ The first time I made this I didn’t have enough peanut oil around, so I supplemented it with refined grapeseed oil (half of each). It worked really well for me, so I imagine subbing the full amount of peanut oil with a neutral-flavored, high smoke point oil (like refined grapeseed) would be ok.
² It may solidify a little and get a tiny bit cloudy depending on the oil used. If reheated/brought to room temp it will return to a liquid state. This would make such an excellent dipping sauce for more than just dumplings and potstickers! Great post.